If you want to edit video on the go, you’re going to need one of the best laptops for video editing. Luckily, that’s what we’re here for. With this guide, we’ve found all the best laptops for video editing, both in high definition and Ultra HD (4K) resolutions. Finding the best laptop for video editing can be hard, though. This is mainly due to the fact that video editing is extremely tasking on your computer hardware, especially if you’re using a laptop. That’s why we created a list of the best laptops for video editing in 2019, as our expert advice means you can shop in confidence. We’ve also went ahead and included our exclusive price comparison tool, so you can take advantage of all the best deals across the internet. The 15-inch 2018 MacBook Pro is hands-down the best Mac laptop ever designed for video editors. 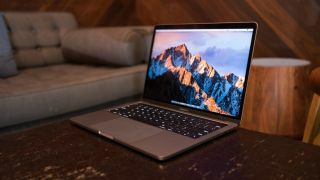 Apple has packed loads of upgrades into this version, offering you the latest generation of Intel Core i7 and i9 processors with six cores, and it now supports up to 32GB of RAM, making this a very adept laptop for video editing. Discrete graphics are provided by a choice of AMD Radeon Pro GPUs, making this the best laptop for video editing. The innovative Touch Bar makes it easier for videographers to intuitively access commands, while the Retina display on the 15-inch model offers more than enough pixels should you want to edit at native resolution in Full HD on the move. However, if you are editing 4K, then you'll be disappointed by the limited resolution. While Huawei might not be the first company you think of when it comes to laptops, especially laptops you can use for video editing, that should change with the company's phenomenal MateBook X Pro. It is a gorgeously-designed laptop with a stunning screen (albeit with a rather odd aspect ratio), and it comes packed with cutting edge components, and a battery life that runs rings around many of its rivals. It has plenty of horse power for editing videos, and it's price is very competitive, making it a great alternative to the MacBook Pro if your budget doesn't stretch that far. The Dell XPS 15 is a brilliant laptop it its own right, and it really excels when it comes to video editing. It comes with a gorgeous 15-inch InfinityEdge screen, and the very top end version has a 4K color-accurate display which makes it perfect for video editing. It's also got plenty of processing power as well, making it a dab hand at rendering video files, which is important when looking for a laptop for video editing. The HP ZBook Studio G3 laptop easily fits in the Ultrabook category with a weight of a tad under 2kg and a thickness of only 18mm, slightly heavier and a smidge thicker than the Precision 15 5000 but more portable and svelte than Lenovo's laptop. Where HP manages to score highly is when it comes to sheer value for money when it comes to powerful components, with a high performance processor and gorgeous 4K screen, which makes it one of the best laptops for video editing. The Surface Book 2 (13.5-inch) is one of the most powerful 2-in-1 laptops in the world. While 2-in-1 laptops may not be the first choice for video editors, the Surface Book 2 has some powerful enough components to handle video editing if you go for a model with a dedicated graphics card. Brilliant build quality and excellent battery life makes this a wonderful device for using as either a laptop, or as a powerful Windows 10 tablet. The tablet mode is convenient if you want to shoot footage and edit it while out and about. Apple's laptops are great choices for video editing, and if you want to save a bit of cash, then last year's MacBook remains a brilliant option, that's a fair bit cheaper than this year's MacBook Pro. You get an Intel 7th-generation Kaby Lake CPU, which brings improved performance and longer battery life while keeping the body thin and light. The Mac App Store has a large number of video editing programs that play to the MacBook's strengths, and you should be able to get a decent deal now that it's been out for a while. Lenovo’s ThinkPad P70 was one of the first notebooks featuring Intel's Skylake processor, which should give it a boost in performance compared to Broadwell or Haswell chips. Equipped with ample storage and plenty of RAM, an excellent keyboard and a wide selection of ports for connectivity, Lenovo is positioning the ThinkPad P70 as the ultimate workstation that you can take on the go without missing your desktop. Also worth mentioning is the X-Rite Pantone calibration tool, available as an option, which is great to keep your screen accurate for production work, as well as the Quadro GPU that comes with all the P70 SKUs. OK, so the MSI GS65 Stealth is primarily a high-end gaming laptop - with a price tag to match - but it also doubles as an absolutely brilliant laptop for video editing. This is because it comes with an excellent array of cutting edge components, which includes an 8th-generation Intel Core i7-8750H CPU and an Nvidia GeForce GTX 1070 GPU. This means multi tasking and video editing is handled with aplomb - and if you also want to do a bit of gaming on the side, then it's a no-brainer.